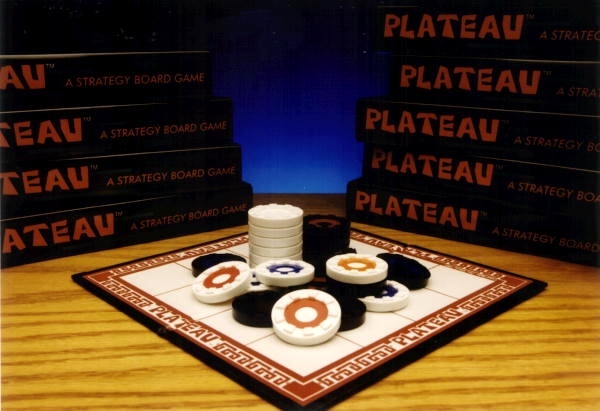 ﻿ Plateau - The Ultimate Game of Strategy and Intrigue. Plateau is a new abstract strategy board game invented in 1986 by Jim Albea. You can read the whole story of Plateau's development here. It is a deceptively simple game played on a 4x4 grid. 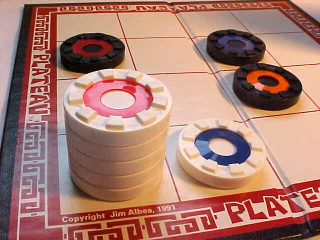 Pieces are added to and moved on the board with the goal of capturing six of the opponents pieces or making a stack of pieces six tall. The Ultimate Game of Strategy and Intrigue. From a few simple rules a complex strategy game emerges. 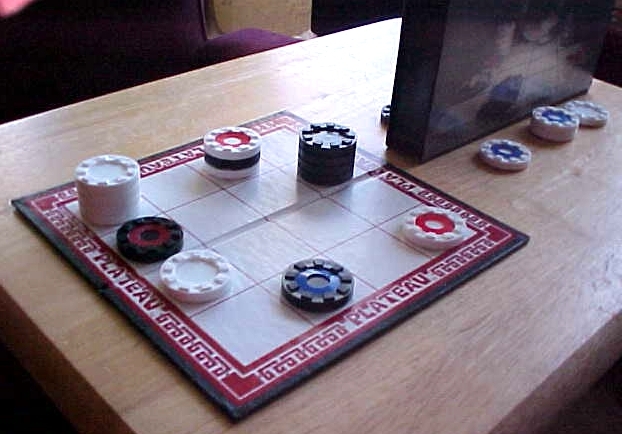 In many abstract strategy games the players have complete knowledge of all possible moves. In Plateau there is hidden or secret information. You don't always know exactly what your opponent has played. This means that you have to devise strategies without perfect knowledge of your opponent's position. As a Plateau game proceeds, complex strategies emerge among bluffs, traps, and intrigues. On Boardspace you can play human opponents in real time or play against a computer robot (coming soon). On GamesByEmail you can play games at your own pace -- not in real time. You will need to have email addresses of anyone you which to play. BoardGameGeek is THE SITE for all things related to board games. Be sure to vist Plateau's page there and give us a rating! Virtual Plateau. See below, Virtual Plateau, free software which has animated help diagrams, a computer robot, and a facility for email games. Virtual Plateau is still the best way to get up to speed with Plateau fast. Order a Game Set! $20 (+ shipping). The Real Plateau Game Set consists of: 24 base pieces, 26 colored snap on markers, a bi-fold game board, rules/strategy booklet, and a sturdy plastic carrying case. HALF PRICE DEAL! You can get a set for only $10 by sending us the record of a game that you completed with another person. Find out how. Enter a valid half-price discount code here. Click here to order a set for $20.00. See above for how to get a set for half price! The Hammond Method: By Paul Hammond -- changed the way Plateau is played. Game Notation How to record a game using SGF format. Feedback What do you think? Were you able to successfully download and run Virtual Plateau? Did you recieve your Plateau game set? Is this site functioning properly? We would like to hear from you! Note: You may see a reference to a P.O. Box in Madison AL. The Madison P.O. Box is no longer used by Plateau Co. 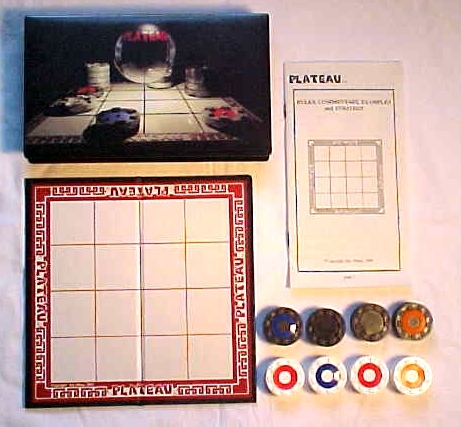 The Trademark name Plateau(tm) has been used in commerce for this game throughout the world since the early 1990's. Copyright © 1986 Jim Albea. All rights reserved.